Have you ever eaten from a food truck? If so, then the reason you went there is either because you were hungover or you knew that food trucks and their minimalistic menu is usually pretty amazing. The reason they make food that people line up for because they perfected whatever it is they’re cooking and people like that; they go back for more. By now, I think you get the metaphor. If you do not like death metal at all, you should stop reading now. I don’t think Jungle Rot is going to be bringing in new fans that are not already into death metal or have basic appreciation for the genre. Let’s face it, when it comes to death metal, some bands like Jungle Rot define the genre. You aren’t going to find anything jazzy djenty fresh with metalcore breakdowns or lengthy progressive solos and atmospheric blackened symphonic doom. It’s just death metal, albeit groovy death metal that has been this way for decades. Apparently, Jungle Rot is ensuring it stays this way a little longer. Having Max Cavalera help out with vocals on Fight Where You Stand was a nice addition; gave the album a little bit of flair, but only for one song. Overall, Order Shall Prevail is a slightly more hostile album than I remember Terror Regime being. Though, it is very much a continuation of where they left off. What that means is there seems to me more double bass drumming and speedier cadences; more aggression. It’s not long, but the 10 songs do pack a brutal punch. Jungle Rot doesn’t break any new ground with their latest work, they are highly proficient at staying true to their death metal roots. 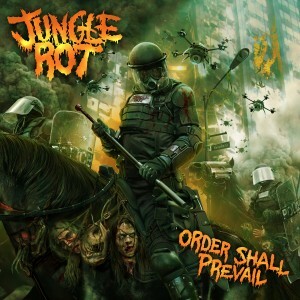 While many other bands are creating new genres by melding old ones, it is refreshing to me to see bands like Jungle Rot do what they do best and just keep doing it well. Posted on July 3, 2015, in Album Reviews and tagged Death Metal, Jungle Rot, Order Shall Prevail. Bookmark the permalink. Leave a comment.